A top Pakistani diplomat has said its investigations into the attacks on Mumbai show they were not planned in either Pakistan or the UK. Pakistan's high commissioner in Britain, Wajid Shamsul Hasan, told Indian media Islamabad's own report on the attacks would be released soon. More than 170 people were killed when 10 gunmen attacked India's financial capital in November. India says Pakistan-based militant group Lashkar-e-Taiba was to blame. India has also suggested what it calls "state elements" were involved. Both Pakistan and Lashkar-e-Taiba have denied any involvement. The attacks have put relations between India and Pakistan under severe strain. Mr Hasan's comments to India's NDTV channel are thought to be the first official words on what the Pakistani document might contain. He said: "Pakistani territory was not used so far as the investigators have made their conclusions. It could have been some other place. Not the UK as well. Because these were the two places I was concerned about." India and the international community have put huge pressure on Pakistan to take action against militants based on its soil and to bring the perpetrators of the Mumbai attacks to justice. Pakistan says that it has arrested dozens of people in a crackdown on groups allegedly linked to Mumbai. It says it has also shut a number of operations run by a charity linked to Lashkar-e-Taiba. Mr Hasan added: "We are not going to do any whitewashing business. We believe in going after facts. Our findings will be acceptable to the world. We will try to satisfy India with our findings. We are addressing the concerns of the world not just India." He also defended the time it had taken for the report to come out. "When you collect material, then you sort it out, you re-do it and re-read it. 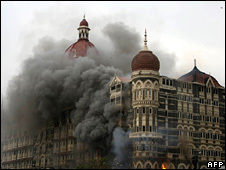 That requires time, so I am sure once they complete it, they will come out with concrete facts that will satisfy the world as to Pakistan's non-involvement in the Mumbai attacks." Mr Hasan also criticised India's delay in handing over evidence, suggesting its dossier could be "fabricated". "You [India] took 45 days to come up with a sort of evidence although you started blaming Pakistan on the first day". The evidence India is said to have handed over includes the interrogation of the surviving gunman, Mohammed Ajmal Amir Qasab, details of phone conversations between the attackers and weapons information. India says all 10 gunmen were from Lashkar-e-Taiba. Pakistan has admitted Qasab is a Pakistani citizen.